A suction cup is also known as a sucker; that uses negative fluid pressure of water or air to hold fast to nonporous surfaces by creating a partial vacuum. It is of small round piece of plastic or rubber which is designed to stick onto a smooth surface using Suction. Suction cups are a lifting technique of many possibilities. For example: handling board materials or concrete slabs. 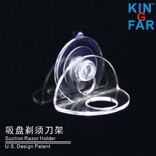 The suction cup is of different shapes such as flat, flat concave, bellows, multi bellows, deep, deep concave, universal, oval bellows, oval flat, oval concave, rectangular bellows, and foam. 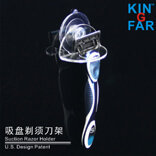 This product is convenient; a compact razor storage solution has certain features of a hook that flex to fit a wide range of razor handle sizes. Since the surface is smooth and easy to clean, and the PVC- free suction cup provides a secure hold on the smooth and nonporous surfaces. It has space –saving design and easily sticks to shower tiles, mirrors, and other smooth surfaces. 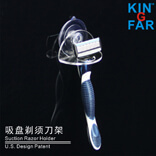 This razor does not require any assembly process. 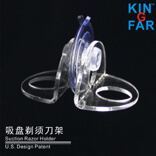 It is constructed of clear acrylic and stainless steel accents and simple to handle.